eBay is the perfect home business for busy parents for a variety of reasons. eBay has no barriers to entry; so anyone can start selling right away. An eBay business is flexible enough to fit into any lifestyle. Parents have a constant stream of products to sell as children outgrow clothes, toys, books, and educational materials. An eBay business can produce a steady stream of income year round and is more convenient and lucrative than a garage sale. Learn how this mom created an eBay business while caring for her young child and finishing her undergraduate degree. Jaimey Castillo has been selling on eBay since 2013. She began selling on eBay when her daughter was just a baby. Jaimey wanted a way to contribute to her household income while spending more time with her daughter and finishing up her undergraduate degree. eBay was the perfect answer since it is flexible, accessible, and was easy to learn and incorporate into her family's lifestyle. Jaimey visits thrift shops mostly for women’s clothing, which has the highest demand. She will also pick up men’s, children’s, and maternity clothes. While clothing is her focus, she doesn't limit herself to one type of product and will pick up anything that she thinks might sell. She uses the eBay mobile app to check completed listings to get an idea of how much an item can sell for in the eBay marketplace. eBay is a great income-producing hobby for families. While many sellers work alone, Jaimey's immediate family helps with the business. Many family members, including her husband, help her find great items while thrifting. Also, her 3-year-old daughter has been fetching labels from the printer ever since she could walk. However, Jaimey photographs and lists without assistance. Thrift stores are Jaimey's main source of inventory. She has a regular thrifting circuit and is constantly researching new places to source. In March 2017, she had 1,200 items listed and steady sales of over $5,000 a month. Her profit averages 60% of sales, or about $3,000 per month. Jaimey sells about 300 items a month and has a 99.9% positive feedback rating. "There are a few pieces of advice that I can give to other sellers that may be struggling. First, do not be afraid to ask for help. In this business you do not have a boss or co-workers so your best resource is other re-sellers. There are many great groups of helpful people on Facebook. Ask lots of questions. Second, do your research. As a clothing seller, I am constantly looking at what the average person is wearing. Even at the grocery store, I am taking note of common and persistent trends. These are the styles and brands I focus on while thrifting. Third, treat your customers like gold. They are the reason you have a business." Jaimey is a mother, wife, and a law student. She is always busy but finds that anything is possible with preparation and organization. 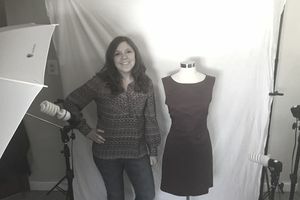 Jamie enjoys what she does, and her eBay store is a positive and creative outlet. Many sellers feel exactly the same way. eBay is a nice distraction from the real world and provides an opportunity for sellers to work with products they love and at their own pace. Just one of thousands of eBay sellers, Jaimey has taken the initiative to use the resources around her to create a fulfilling part-time job that she can do from home. She works on her schedule, is available for her young daughter, and has organized her life so that she can complete her college degree. This is another eBay success story that shows anything is possible with determination, organization, and the desire to succeed.